Work smarter not harder should be stamped across every teacher’s doorway because we never have enough time to do all we need to do. Do you ever leave at the end of the day thinking, “Wow! I got everything done. Now I can go home, make a real meal, and relax.” If you are like most teachers, you are probably making a mental list on your way home of all the things you need to get done between now and tomorrow morning, right? 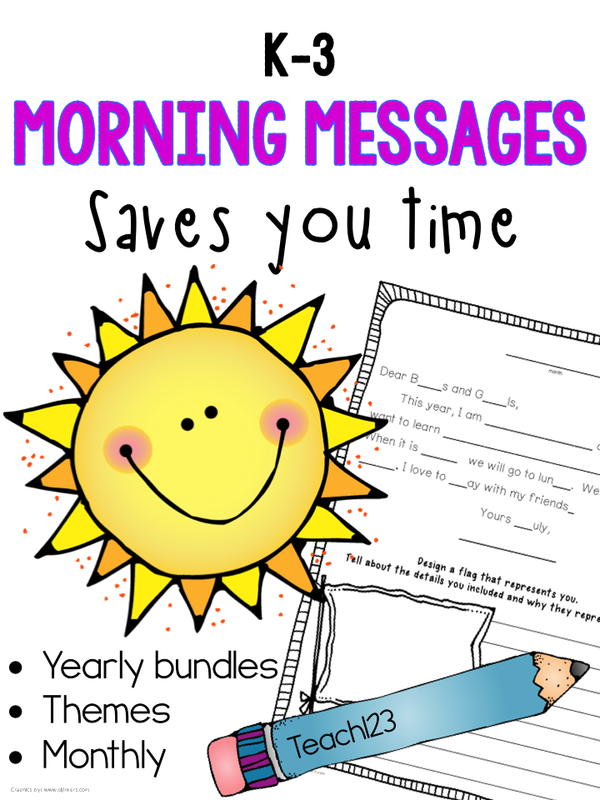 I stumbled across this work smarter way of doing morning messages when I was doing my long term lesson plans when I was pregnant. I love morning messages for elementary students and feel they do a great job of reviewing skills, but it was so time consuming to write a message on chart tablet. The tablet is big and bulky. It was a challenge to take it home with me to prepare ahead of time which meant I needed to do it at school. I didn’t always have extra time to write a quality message at school. I didn’t want my maternity leave sub to have to write messages. She was going to have her hands full with getting to know 22 little kinder kids and all that entails. I did a little brainstorming and decided that I can type much faster than I can write by hand. So, I typed up my first morning message, made a transparency (did I mention that this was in 1999), and put it on the overhead projector. Since this was kindergarten, this was a very teacher directed lesson. Volunteers helped by filling in the blanks, circling word wall words, circling first letter of the sentence with a green marker, circling punctuation mark at the end of the sentence with red, etc. Once my students learned the format, I had the paper waiting on their tables for them. I gave them a few minutes to see if they could figure out some of the message. They loved it! Eventually, some of the tables began to work as teams. I loved the cooperative learning that I was seeing and all of the reading taking place. Eventually, I could see my students were getting restless with the format. They were getting through with it much too quickly. 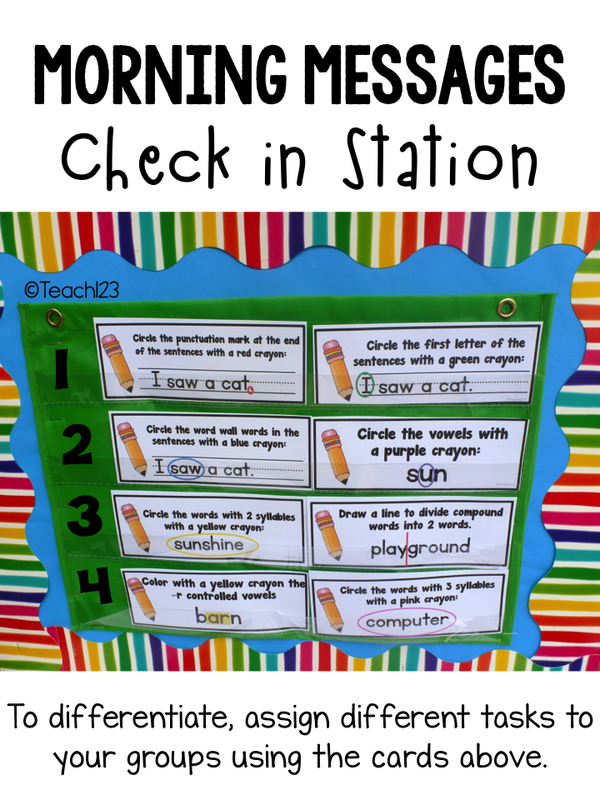 So, I organized a check in station like the one in the picture below. After students put away their backpack, lunch boxes, and turned in their homework, they picked up their morning message at the table by the check in station and found out what their tasks was for the day. The tasks are the cards beside the number. The number is their group number. In the beginning, I only gave them one task. Later on, I gave them 2 tasks. If you shrink the cards or you have a wider pocket chart, you can give them more tasks. You can assign the same tasks to different groups. TEACHER HINT: In this picture is the small pocket chart from Target’s Dollar Spot. I printed the differentiation cards at 75% so I could fit two for each group. I thought you might like to see a sample page and answer sheet of morning message. This would perfect for your Back to School lessons. Click HERE to download this FREE sample. 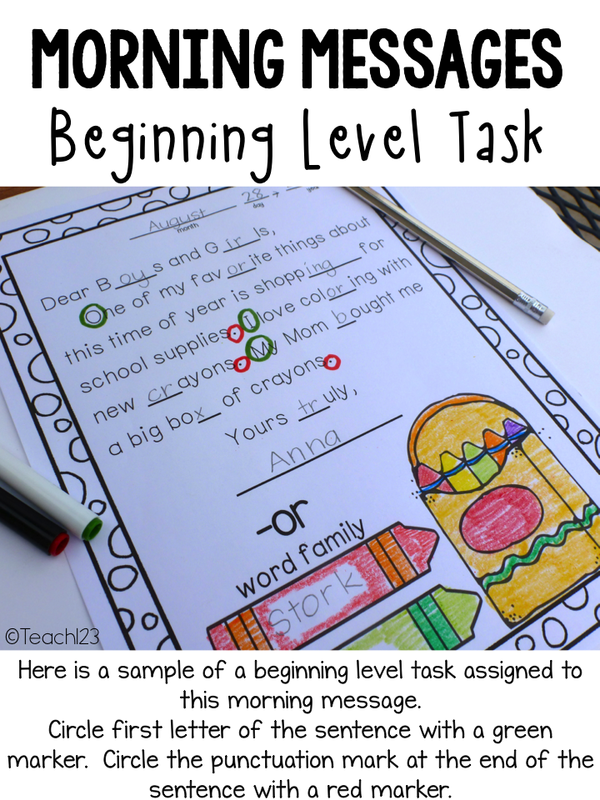 By request, I bundled my September – May grade level packets. I love these morning message ideas! You have an amazing blog! Where can I find your morning message Check in station? The cards for the check in station are included in the morning message (paid) files.